Last Saturday we had the spring meeting of the Braid Society Council. We have three meetings a year at which the Council discuss and take actions relating to running the Society. The Council members are all volunteers who have agreed to take on roles to keep the Society running. We are always looking for new members and with technology, we can include international members of the Council to join the discussions. Between meetings, we keep in contact via email. We can be contacted with any issues/suggestions/improvements to the council at council@braidsociety.com or directly to the Chair, Shirley Berlin at chair@braidsociety.com. Do get in touch either via email, through Facebook or via this website. All members, that can be identified and who are on Facebook have been invited to be a friend of Debbie Braids and a member of the closed group, Braid Society Members. Please contact me via Facebook or treasurer@braidsociety.com if you would like to join. We have a busy weekend ahead for the Braid Society. Tomorrow, 11th April we are holding our first braiding day in the Netherlands. Good luck to them and I hope it goes well. In the north west of the UK, in Frodsham, the Braid Society have a come and try day in the same premises at the World Textile day so we are looking forward to meeting lots of new interested people and on Sunday, we have the regular braiding day in Aldbourne. Members from all over the south of England and Wales meet at Aldbourne to socialise, make braids and learn new techniques. Sami Weaving Course in March. Susan Foulkes is running another online workshop on Braids and Bands, the Yahoo discussion group of the Braid Society. The workshop starts on 28 Feb. 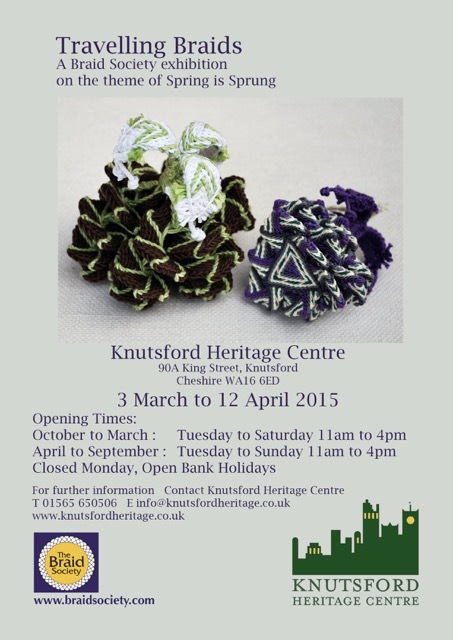 The 2015 Travelling Exhibition will be displayed at the Heritage Centre, Knutsford, Cheshire from 3 March until 12 March. It is a great opportunity to see the exhibition. Happy New Year to everyone! If you have not tried it before, or even if you have, why not make the effort this year to go to a braiding event. We have a braiding event in Adelaide, Australia on Thursday, 15th January and then a number of events around the UK. If you live in another country, why not set up your own braiding gathering? We have lots of information on the site about what to do and one of the Council can always help with any questions that you have. Looking forward we will be having an online tutorial starting in March. This is set up on our Yahoo group, Braids and Bands and we are looking to set it up on the website as well. The Council would like to wish everyone a very Merry Christmas and a very, very Happy New Year. This year has been a great year for the Braid Society with the Society growing throughout the year, lots of meetings at Come and Try days, Try Braiding and other names that mean a group of us have got together to enjoy braiding and expand our knowledge and demonstrations at lots of shows and other events. During 2014 we have also migrated our web site to the hosted membership site and this has worked extremely well for us - online registrations and renewals have been great for everyone. We celebrated our 20th Anniversary at the end of our 21st year with a great AGM weekend with 3 workshops where we learnt lots, laughed a lot and spent time getting to know other members. We also hosted a wonderful exhibition - photos will be on the website in due course. Work is underway for the next International conference in 2016 in Tacoma. More details to follow next year. With all this going on, 2015 is going to be an exciting year. Tomorrow, Sunday 14th Dec is the Christmas Come and Try day at Aldbourne. Europa Dawson will be teaching Chinese Knotting and those not taking the class will be braiding and chatting. Don't forget to bring a plate of food for the shared lunch. The December 2014 newsletters have been sent out by post and email. If you do not receive yours in the next day or two, let me know at treasurer@braidsociety.com. Many thanks to Janet for another great edition.